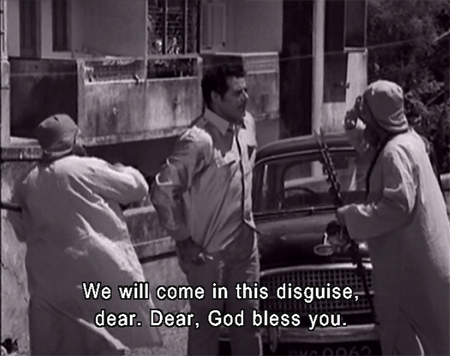 As the film opens, there is a gang of smugglers looting Mother India, led by goonda Kalu (Shetty). They are being harassed and thwarted by a masked man they call “Choron Ka Chor.” When Kalu spots a little boy named Raju (Master Ripple) watching them one day, he kidnaps him thinking that he’s spying for the hated Choron Ka Chor. Luckily for little Raju, Choron Ka Chor (Dara Singh) has hidden himself in the warehouse and rescues him. 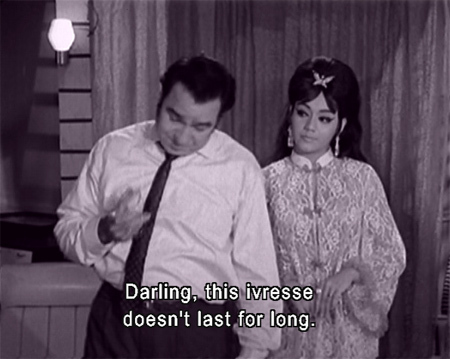 This does not go down well with Kalu’s boss, Madanlal (Madan Puri), who also runs a club where his girlfriend Sophia (Jayshree T) dances, and who uses nonsense words to express his love by comparing her to a fine whiskey. So sweet! 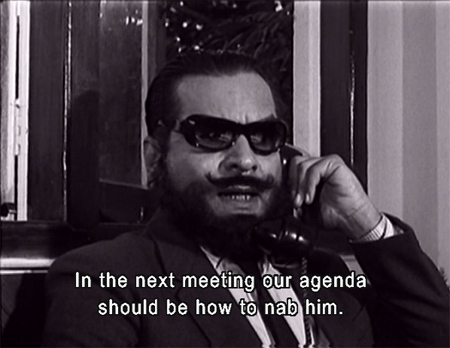 Madan calls up his associates and tells them of Choron Ka Chor’s latest derring-do, and they are not happy either. I wish my meeting agendas at work were like that. Also, I wish people wore fake mouche-beards and thick glasses to hide their identities. 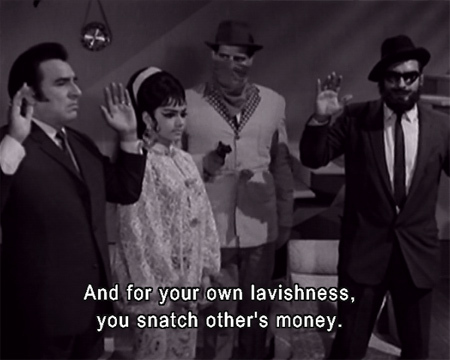 Alas, my job is nothing like a Hindi B-movie. 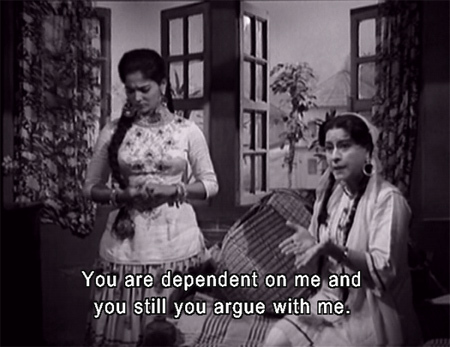 In any case, Raju’s mother (Indira Bansal) is blaming his cousin Rupa (Shabnam) for losing track of him, yes, at the fair. They are greatly relieved when he reappears in the company of our Choron Ka Chor, also known as Ashok. 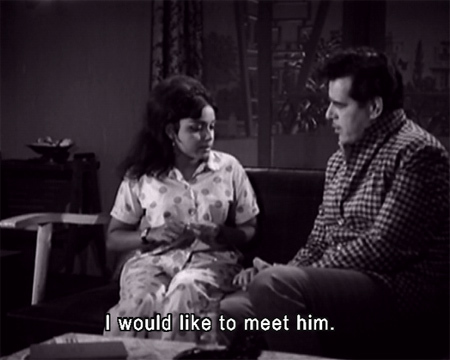 Ashok himself lives with his younger sister Beena (Meena T). She is in love with her classmate Rajesh (Roopesh Kumar), and confides in her brother. 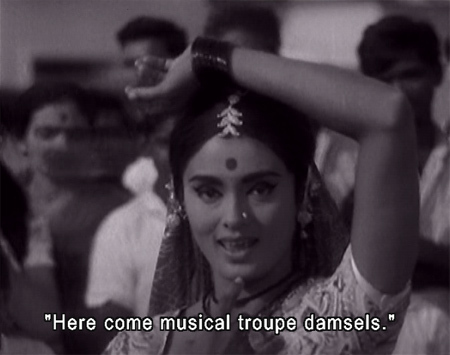 When the smuggling gang convenes, there is a dancing troupe outside with musicians Makhan (Agha) and Lakhan (Bhagwan) and the dancer below (does anybody recognize her? Is she Paro or Neelam maybe?). They sing a lively dance tune (“O Bandhu Suno Patli Qamar”) which I love. 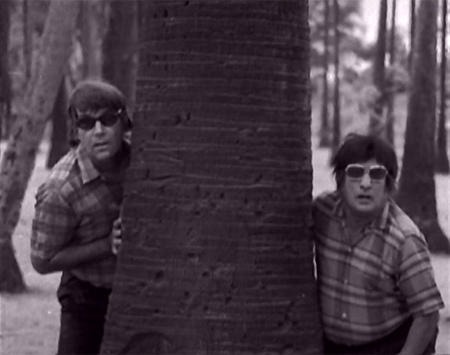 Makhan and Lakhan are masters of disguise, it turns out, and they are also spying on the smugglers for Ashok. Ashok himself doesn’t recognize them sometimes when they show up to give him information. Ashok also meets up with Rupa again when he rescues her from an eve-teaser and then gives her a lift to the market where she sells baskets for a living. She is constantly criticized by her aunt, but Raju always sticks up for her and since he’s the apple of his mother’s eye he manages to make things a little easier for her. Still, it’s not much of a home life! She confides in Ashok that they owe 15,000 Rs to a moneylender and if they don’t pay him back soon they will lose their house. Up until now Choron Ka Chor has only been making sure the smugglers’ activities are disrupted and then made known to the police, but at their next meeting he does something new: he robs them. 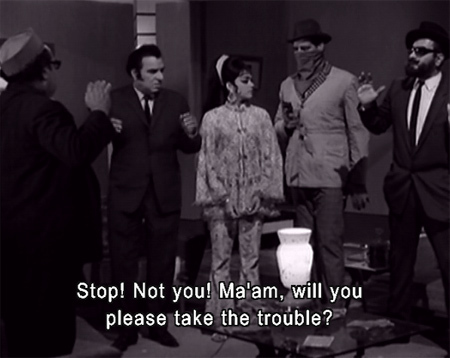 I so love Jayshree T’s outfits throughout this film. He sends the money to Rupa so that she can pay off the moneylender. She recognizes the handkerchief that the money comes wrapped in as Ashok’s and smiles that smile of one who knows she is loved, and who loves in return. Meanwhile Ashok is working with Makhan and Lakhan to find out the gang’s next steps. Madanlal: At 5:00 Miss William’s ship will deliver the gold. Then we will pay Miss William. Okay? 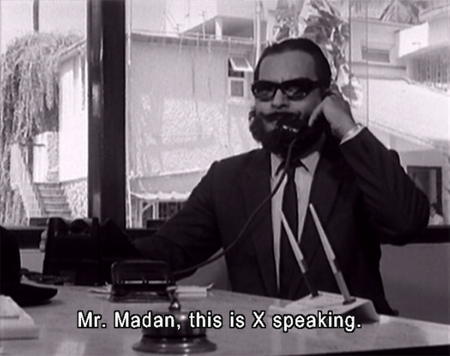 Anyway, thanks to Mr. X Choron Ka Chor’s identity is revealed, and we are treated to a lot of dishoom-dishoom. Meanwhile Kalu for some reason has kidnapped Rupa and Raju. Raju cleverly takes the keys out of Kalu’s Ambassador while Kalu is driving it, stopping the car. He and Rupa jump out and run, chased by Kalu, and Rupa is hit by Ashok in the jeep he’s escaping from the gang in. The result is predictable. Ashok promises the doctor that he will get the money necessary for the eye operation to restore Rupa’s sight. He decides to rob Seth Dhaniram, who has gotten rich from smuggling, and who also (unbeknownst to him) happens to be his sister Beena’s boyfriend Rajesh’s father. Incidentally, I have left lots of little details out of this narrative, including Rajesh and Beena’s Beach Blanket Bingo style romancing (and another great song, “O Mere Dildar”). 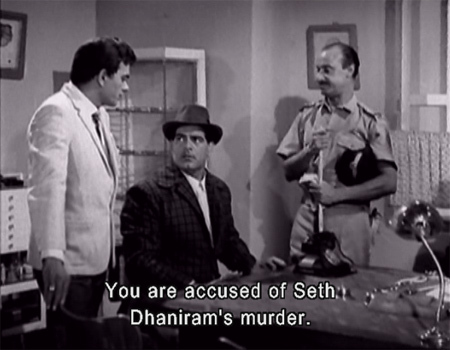 Mr. X follows Ashok and shoots Dhaniram, who names Choron Ka Chor as his murderer before he dies. What will happen next? Will Ashok be framed for Dhaniram’s murder? Has he lost his moral compass in his need for money? Will Rajesh still want to marry Beena when he finds out who Choron Ka Chor is? Will Rupa recover her vision, and can the smugglers be stopped before they run our beloved country and its economy into the ground? 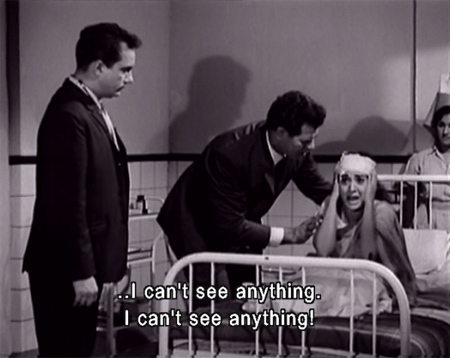 (It’s a very preachy film in places!) Despite further goodies like another good song, hot pokers and a spiked wall, plus Shetty and Dara Singh mudwrestling, I would only rate this as lukewarm fun. I’m not sure why exactly, except maybe that Helen needed to be in it. Posted on July 22, 2009 at 3:29 pm in Hindi movies	| RSS feed You can skip to the end and leave a reply. It looks like a fun movie. Though I must admit that I was not much aware about the existence of a movie by this name. And considering that the movie has some much “beloved” baddies like Shetty, Madan Puri etc, it sounds like a promising movie. I agree that the minutes of meeting of the Baddies inc. is always quite brief and to the point. I’m glad to see Dara Singh make a return to your pages. He is the ivresse that keeps on giving. He is very ivressive :) I just got a huge pile of VCDs today that look like ooooooodles of fun! Sounds like a fun movie though. At least your review is pretty funny. LOL at meeting agenda and minutes. I used to like Shetty – he died when I was in high school or a few years later than that. There was a write-up about him that he did his own stunts and was actually a very soft-spoken guy. Anyway, in most movies he hardly spoke, he was just the baddie who would have a scarf round his neck and get bashed by the hero. What I have found good about B-grade movies is that the otherwise-not-so-famous characters tend to make an impression in your mind. When you have an A-grade movie, it is normally dominated by the stars. The lesser actors hardly have any screen time. That is one reason I like B-grade movies. Even otherwise they are good for timepass. No hype and usually no expectations anyway. 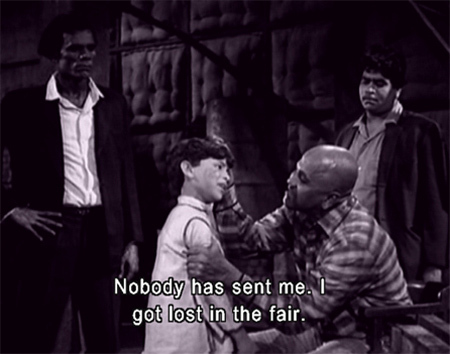 Two movies that I distinctly remember Shetty are “Evening in Paris” (he had a decent part in this) and “The Train”. Rohit shetty, the director of movies such as Singham and Dilwaale is one of his sons. According an interview I saw w Anupam Kher, Rohit Shetty mentioned that Sheety was also a fight director. In one of thr fight scenes gone wrong, a stuntman died. Though no one blamed him, Shetty took this as his fault and descended in alcoholism and died years later. 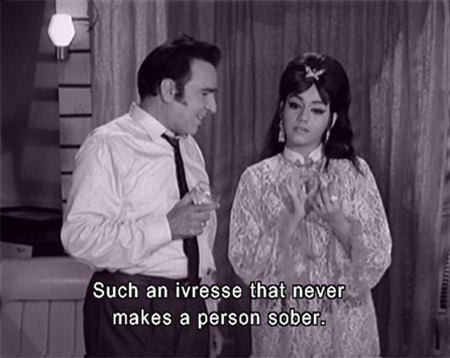 So – is “ivresse” a word anyone has encountered before? And if so, please include where you encountered it – in what country! Oh PS: I think we see Beena in one of my favorite kinds of attire, the wearing of western pajamas. Are these her nightclothes in the movie, or are they an outfit she might wear around the house or outside of it? “Ivresse” is French for drunkeness, and as I was double checking in my dictionary, I see it also means rapture or ecstasy (although we were not told this in French class). Perhaps this is another indication of villainous pardesi sophistication. Or, maybe that he was from a French colony like Pondicherry! LOL@villainous pardesi sophistication! Hey-I watched A Throw of Dice last night, and it’s so absolutely gorgeous; thanks for the tip on where to find it! I’d see it just for the title. I usually like anything with the word ‘Chor’ in it. 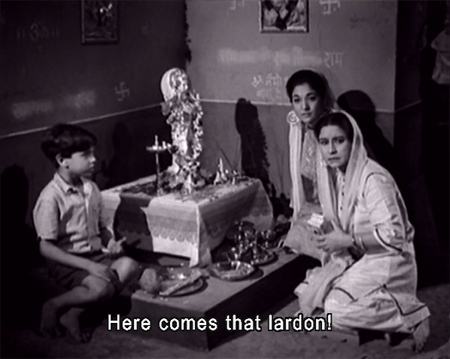 Hindi film chors are so much more interesting than the goody-good heroes. Yes they are, especially when they are Dara Singh! I also wish my meeting agendas were so interesting, unanimous and short like in this film! Why aren’t our lives more like B-movie? Will have to look up for the songs on you tube or music india online. I don’t think I could possibly make stuff like this up. The people writing and directing these films had unbelievable imaginations!!! Working on the review right now ;-) I’m glad you liked Solva Saal, it’s def. one of my favorites! looking forward to the review of throw of dice! Oh..I am salivating. This one looks so good. Hope it’s available on line.